Austria's refugee camp was large and crowded. The director was hard-pressed, for each refugee took considerable time to process. Everyone knew from the start that one would be in the camp at least two weeks before being set free. George and I were given beds in a communal room shared with about twenty-five people. One night as I slept I had a delightful dream by which God imparted a word. I told George about it in the morning. I had seen a lovely, clear-running river. Siegmund and I were in a boat fishing. George could not see it. We had tried contacting Siegmund before the Germany caper, and not one word from him since. "Oh, not that fellow!" he sniffed. "He has forgotten you. He doesn't respond to your note. I bed he hasn't the slighest concern for your welfare." "But George," I objected, "according to this dream I feel very sure that I will be set free this very day." "Impossible!" George laughed. "You have to wait for the interview just like everyone else, and there are lots and lots of people here ahead of us. Everyone says..."
People around us had been listening to George's remarks, so I turned to relate the dream and its meaning to them, since they already knew our escape story and the details of God's deliverance. Some had believed in Jesus after hearing our story, but this they could not swallow. They all had been waiting longer than we had for the camp director's interview. So they all laughed together with George as we walked to the dining hall for breakfast. I still believe I'll be set free today," I told them "Maybe I have interpreted it wrongly, but according to the dream I'm supposed to be out of here today." After a meal it was the custom to walk leisurely down a huge hallway for exercise. George and I were strolling along when someone at the window called out that the camp director was coming to our building (the hallway was on the second floor and looked out on the main entrance). I went to look and saw the director. There was a man with him. In a few minutes, the director and his companion found me. I recognized the other man, of course. It was Siegmund! He was happy and astonished to see me. "You are supposed to be dead at the border!" he exclaimed. Then he explained what had happened to him. He had been away on a trip to America. He was just now getting to read his mail. He read my note and went to the hotel at once. Failing to find us, he read the long list of refugees at the camp and discovered my name. What perfect timing God has in getting His children together! He allowed time for George and me to learn our lesson, then arranged for Siegmund and me to be reunited like this. God is good! As a friend of the director, Siegmund got me an interview on the spot. I was asked a few questions in the main office, and the director said to come back later at my convenience for the remaining questions. Free to go with Siegmund, I spoke to George before departing. My friend was very grieved that he could not go. I asked the director for him, but was told that he could not let George go just yet; his story changed too many times back in Germany. "He will have to be interviewed a long time before we can let him go." Siegmund arranged lodgings for me, and I began work at the mission, which supplied Bibles and literature to Christians in communist countries in Eastern Europe. As soon as possible I wrote and sent money, food and other things to Aurica and the family. A mission worker came one day from visiting the refugee camp at Trieste, Italy. He told me he was at the camp looking for me. He found Josef and Stefan instead, who informed him of my going on to Vienna with George. They decided to accept his offer of help rather than wait for what I could do. Both Stefan and Josef now reside in Europe with their families. There was plenty of work at the mission with Siegmund and his brave and dedicated cohorts, but I knew God was calling me to go to America. If I did not go there before two years, the law would prevent me from immigrating. So I left Siegmund and the mission and flew to Los Angeles, finding a place to stay with a fellow Romanian. Trusting God to work out the reunion of my family, I called Aurica and reassured her of God's intention to bring us together in America soon. It was February 3, 1976 (over a year since the escape) when I settled in Los Angeles, and things still looked hopeless to Aurica. I cried to God constantly for Aurica and the children. Sometimes Aurica was allowed to telephone out and speak to her "runaway criminal" of a husband. One time when she called she was crying. "The police in Bucharest said that there is no way I could ever get a passport," she lamented. She even though that she might not be able to force herself to face the authorities again with the passport request. But God had given me a word that He was going to favor us, according to I Samuel 2:26. "I know God will finish this work He has started," I told her. "We will soon be together as He promised. Be joyful and trust in..." Our connection was cut, but not before she had heard God's wonderful promise. I continued to pray for my family's release, while working nights at various jobs and ministering to Romanian people during the day. At this time God gave me an unusual dream. In the dream there was a guide to lead me. We came upon a distinguished, older gentleman. The guide told me that the man was Henry M. Jackson, a United States Senator from the State of Washington. I saw the Congressman holding a golden key in his hand. 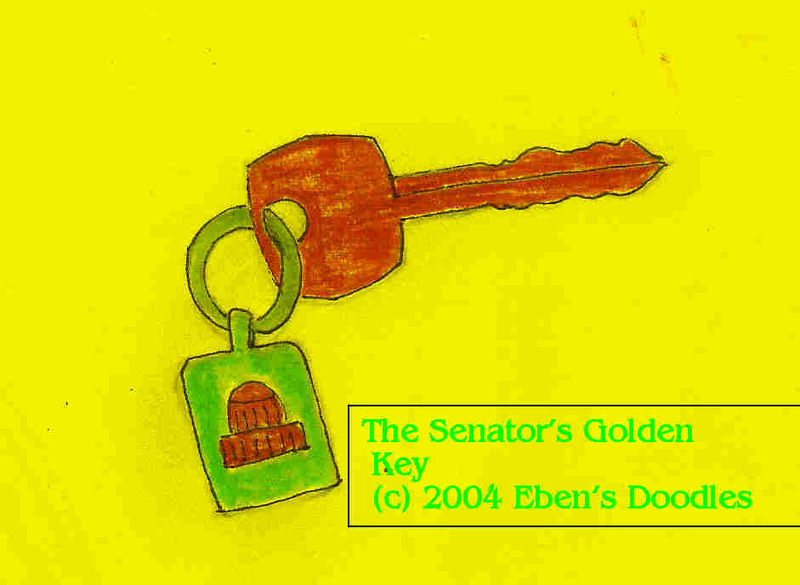 The guide explained that this was the key the Senator would use to gain my family's release. I awoke and was given a vision that repeated exactly what I had seen in the dream--a divine doubling that, as Joseph told Pharaoh, meant that God would certainly do what He had promised, and quickly! But Senator Jackson was completely unknown to me. I had never even heard his name before. So I asked my Romanian friend. He had been in America for a while and was well-acquainted with the Senator's name and reputation. "He's very powerful in Congress," he said. "And he is a compassionate man, a great help to refugees." My friend found Senator Jackson's Washington, D. C. address, and I wrote a letter relating the dream I had of him and gave a few details of my family's situation. Senator Jackson wrote back promising to do as much as possible to gain my family's release. I sent a second letter giving more details of my wife's difficult situation, and the Senator's second response made my heart leap for joy. "I was really impressed with your testimony about how you left Romania, and with your dream about me," he wrote. "I am sure that next week your family will receive the passport." As my friend read the letter to me, I was praising God. I was even more joyful when Aurica called a few days later. She was crying again, but this time with tears of joy. "I don't know what happened," she exclaimed, "but I just picked up our passports. The police came to the house and told me to take the first train to Bucharest at once!" So she rushed to the capital, and at the government passport bureau a high-ranking official handed her a passport. "Here is your passport," he told her. "Get out of the country as soon as possible!" Aurica was ready. The suitcases were packed. The government gave her 2,000 lei (r about $20.00) for our house, which was just enough to cover the taxi fare from the Vienna train station to the refugee camp. The furnishings and our belongings were given to the poor. Off she went, taking our seven children (for Elijah Jr. had been born after my escape) by train to Austria. Rejoicing over what God had accomplished, I still had a high hurdle to overcome. How was I to get a passport to meet Aurica in Austria. U.S. law said that I could receive a passport to travel from America only after two years residence in the country. If before that time I left the U.S. my ticket might as well be one-way. After submitting this to God in prayer, I went to the U.S. Immigration Department in Los Angeles. "Impossible," responded a clerk to my request. I asked to see the director. Trembling in my shoes, I explained to the director my family's difficult status as refugees and my need to meet my wife Aurica and our seven children at the camp in Austria. "Go to the office downstairs," he said. "I promise that they will give you what you ask for there." It was exactly as he promised. The somewhat rattled clerks issued me a White Passport, the first of that color I had ever seen. I flew at once to Vienna. At the refugee camp the director met me. He was astonished to see me back so soon. "Why did you come back?" he cried. "You made a big mistake! Now you won't be able to return to America." I showed him the special White Passport. He too had never seen one and asked to examine it. I went to see Aurica and the children, for they had just eaten a meal and were resting in their quarters. I found them and we all rushed into each other's arms. There was crying and rejoicing all that night and morning. Since the White Passport was good for a year, we could spend the summer resting and enjoying family life together again after a lapse of two long years. God had finished what he had started so long ago in Romania. Everythng came to pass despite all the efforts of Romanian government officials and police! And with my unique White Passport, we could all fly to America, to begin life anew and serve God as He had called us to do. Finally rested, we took leave of Vienna. Though we embarked on a jet airliner, we really flew to our new life on the great, soaring wings of God's grace.